Earn loyalty points every time you shop at all4paws! Make sure you register when making your first order - you will have the opportunity to register an account after checking out. Login for subsequent orders to ensure all points earned are credited to your account. You can then use these points at any time to get a discount against future purchases. Please note that we are currently experiencing supplier issues redeeming Loyalty Points when checking out with Klarna. Until further notice, customers will need to check out with PayPal to redeem their points. Alternatively, if you do want to check out using Klarna, please contact us and we will supply you with a discount code that equates to the total value of your points that you wish to redeem. 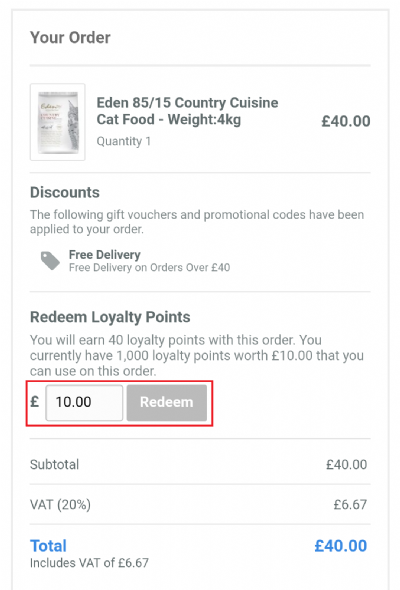 For example, if you wished to use 600 points, we will give you a discount code for £6 off. Please accept our apologies for this issue, which is beyond our control. We will update this page when the issue is resolved.